Well done on getting through Fifth Week! You are all in our prayers as we get to this busy stage in term. If you need some peace and quiet away from it all, you know where we are! We’ve lots of opportunities for prayer and reflection in the coming week. On Friday, we will be holding our termly Nightfever event at Blackfriars. From 7:30pm, the candlelit church will be open for all to come and spend some time before the Blessed Sacrament, accompanied by beautiful choral music. Teams of two will go out into the streets and invite passers-by to enter and light a candle. There will also be opportunities for confession, or simple conversation with a priest. 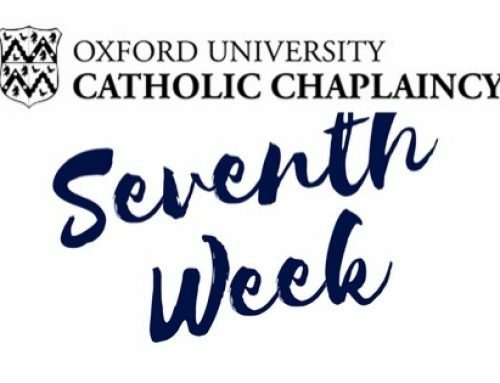 If you would like to be involved in any aspect of the evening, be it music, evangelisation, or set-up, please contact myself or Georgia Clarke (georgia.clarke@regents.ox.ac.uk). Do you volunteer for any charities or projects? Would you like to? 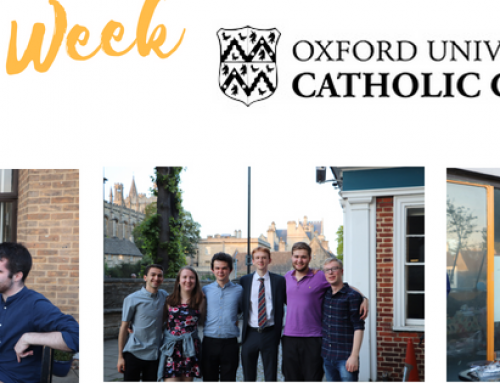 Since this week is Student Volunteering Week, we make a strong plea to anyone involved in projects both in and out of Oxford, or interested in discovering more, to attend a meeting on Sunday 25th at 4:30pm – 5:30pm in the Blue Room. 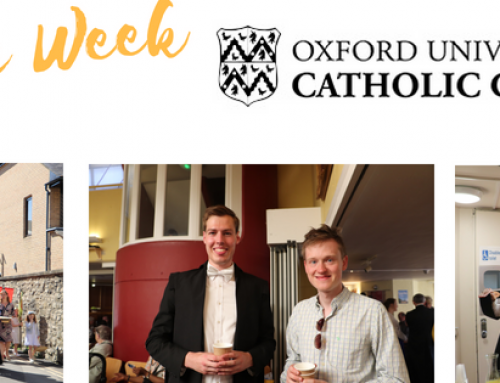 It will be a chance for us to reflect on the importance of social outreach, and to find out about the wide-range of opportunities available in Oxford. Each of us can be enriched by placing our volunteering activities in the context of our faith, so we would love to see you all there. What you do might inspire others; hearing what others do may be an encouragement for you! Here is our full schedule of events. See you soon! 7pm – Theology of the Body is cancelled tonight, but returns next week. Please contact simone.delzin@sant.ox.ac.uk for more information. 1pm-2pm – Witnesses to Hope: a practical guide to Catholic Apologetics. Unsure about how to respond to the ‘tough questions’ about our faith? Join Becky for a short presentation and discussion on different elements of Catholic Social Teaching, this week: Does the Church affirm the dignity of women? Simple lunch and snacks provided! 6pm – Scripture Series with Fr Nick, Who does Luke say Jesus is? Talk open to all in the Blue Room. 8pm – Theta prayer group for postgraduates with FREE pizza and cakes. Join us for delicious, homecooked soup from 7pm, followed by an exploration of What can we do in Heaven? by Fr Simon Gaine OP. As always, this will be followed by social time and prayer time in the Chapel. All welcome, so please invite your friends! 4pm – Cake and Crafts in the Strange Room – open to all students! 9pm – PostGrad social in the Blue Room. Wine and nibbles provided, just ring the doorbell at ‘The Old Palace’ and we’ll let you in. Please contact Anna – anna.branford@some.ox.ac.uk – or join the Facebook group for more information. Student Cross information evening. Want to find out more about the Holy Week pilgrimage to Walsingham? Join us for a presentation and a chance to meet experienced pilgrims. the Chaplaincy of the Sorbonne-Assas International Law School, we will spend a day or two in Paris before joining the walking pilgrimage to the beautiful Cathedral of Chartres, with hundreds of other students and young professionals. More details to follow soon, including estimated costs, but please contact Louis Neviaski, lomanev@yahoo.fr asap to register your interest! 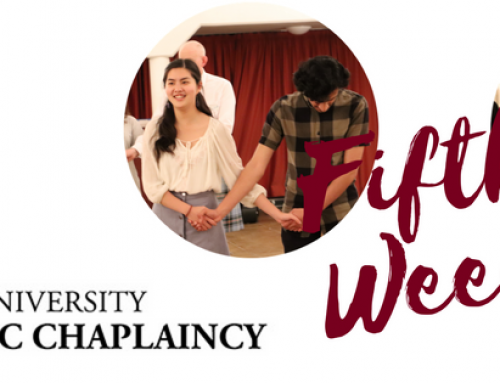 Student Cross is an opportunity to spend Holy Week differently. A pilgrimage which started in 1948, 11 groups of all ages and backgrounds walk to Walsingham, living in community and collectively carrying a cross as a witness to the people that we meet on the way. All pilgrims gather at the end of the week in Walsingham for the Easter celebrations. 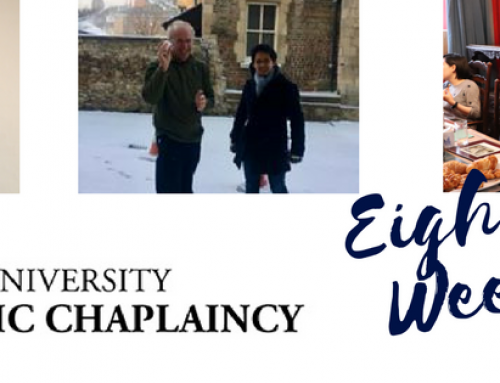 The Oxford leg will be led by former Chaplain Fr Simon Bishop SJ! Hope you have a great week, we are praying for you.